What not to wear. This post is not what it may appear to be: a list of clothing and accessories that are “no-no’s” for women who are older/smaller/taller/sassier. It’s more like a philosophy of what no one needs to wear, regardless of age or size. If you’re a regular reader, you know for sure I don’t write lists of what not to wear. I’m in the awesome women’s club (as are you) whose “rules” are: wear what you love, support other women, and break rules whenever you are so inspired. Things that make you feel bad about your body; they’re too tight or loose, too long, too drab or overwhelming. You’ve never felt grrrreat wearing them but maybe you feel inhibited to give them away, because you bought them. It’s freeing to get them out of the closet, trust me. Or you can fark with them until they get to what you love. Source for this hack is here. Things you’ve always worn but never given much thought to. For me one example is high-collar shirts or sweaters. I fall in love with them in the shop or online. But they never, ever flatter my face. I look much better in a vee-neck or scoop-neck. This is the neckline I love. No turtlenecks here (plus, it’s 83 degrees today). Things that itch or bind or make your feet hurt. Some women, even in their over-50 years, can still rock a high heel. I applaud you! For me, those days are over and cool sneakers are my best friend. Likewise shapewear (for me): it makes me feel like an unhappy sausage. If you love it, you do you. Anything that doesn’t inspire you (borrowing from Marie Kondo – have you heard of her? ). Life is short, wear the joyful clothes. Too much joy here? That’s Gucci for you. Are you feeling the urge to purge? The seasonal wardrobe change-over is a terrific time for it. Tell us about it in the comments, please. This article was featured on Links à la Mode weekly fashion roundup by Independent Fashion Bloggers. Want to start your own fashion blog? Find out how here. I have this thing about knowing if the clothes really speak to me or are just pretty. It took a while to recognize the fact that there are certain styles I will never wear but I can now walk away from the ‘oh that’s pretty’ clothing knowing this. I love the wear what the hell you want to !!! I know where you are going! (well, you’re probably back by now). Looking forward to seeing photos from your adventures. I’ve been much more ruthless in my clothes purging lately; anything that doesn’t make me feel great wearing is OUT the Door! Patti, I love this post! Absolutely, women should wear whatever makes them feel good! Or joyful, to quote that famous lady:), joyful. I totally agree about the shoes–comfort rules for me, too! Oh, and yes, I’ve been purging for the last couple of weeks. You live in a house too long, it’s amazing what accumulates! Including clothing. I donate gently used items to local charities whenever I can. I love turtlenecks and v-necks. LOL. Great tips. I love those Marc Fisher sandals.I actually just looked at them in Nordstrom over the weekend! I feel about ruffle necklines the way you do about turtlenecks. I love the way they look, so have fallen prey to buying tops with them. But I cannot get used to liking them on me and feeling comfortable. Finally, after donating several, I’ve learned to just appreciate them from afar. Oh I love these tips! That one with the too big pants is brilliant. Except I have to go to the bathroom way to often to deal with that every time! But man, they sure look cool. I hope you have the most wonderful adventure! Yes to this! We should wear items that bring us joy and comfort . Not feeling like splurging! Many items in my closet to bring out in the new season ! I so would wear the stilettos. They are so me! Oh, hell yes to this, Patt! Don’t wear anything that doesn’t make you feel awesome and a big bossy badass! Enjoy your break (loved that “Wayne’s World” quote). Wow! I LOVE this mind set. Personal style is such a fun way to really express yourself and I LOVE the idea of wearing the joyful clothes. It just doesn’t make sense to me anymore to hide behind tent clothes or things that I don’t love. Of course it took me most of my twenties and thirties to figure that out BUT happy to report that now in my forties I rock a style that pleases me and makes me happy. Turns out my personal style is a bit edgier than I thought it was and guess what?? I LOVE it! Awesome post! well, these are my kind of rules!, rules to feel better and more fabulous and comfortable too!. I totally agree that shoes that hurt are a total no-no for anybody, even if I still have a pair or two which are not sensible at all. 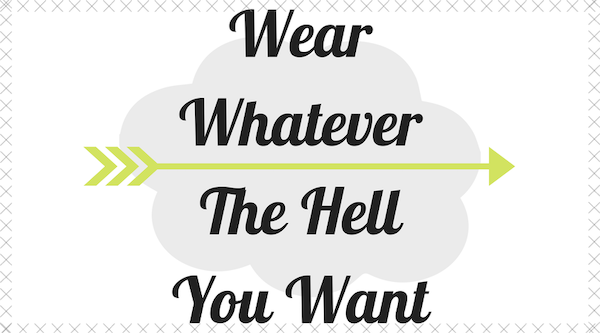 My favourite tip is about wearing whatever inspires you! , joyful clothes! I spent two weeks purging my closets. While I get rid of items every year, this is the first time I went through EVERYTHING. This includes three closets and multiple storage containers where I was saving the special items I would wear when I “lost the weight.” I took 20+ bags of clothes, shoes, jewelry, and accessories to my favorite thrift store. These included items I wore as a school administrator, and I retired 11 years ago. Once I got past the guilt (so many things! ), I can’t tell you the liberation I feel. I keep marveling at all the clothes I have that I love to wear, and how quickly I get dressed every day in outfits I love! I have promised myself that I will NEVER get this overwhelmed by things again. I’m working on donations to put aside for the charity truck to pick up this weekend. I just decluttered 6 pair of shoes and 1 pair of boots, most of them with heels. I already feel much better — and they’re still in the basement! Patti……Wonderful follow-up to your body positivity post (3/21/19). As always, thanks for your insights and fellowship. I frequently try to upcycle my clothing to make it more “me.” I’m with you so much on shoes, I’m even a bit wary of flat-forms that are high-ish b/c of a bad knee and being afraid my foot will “shift” off them. Best of fun on your adventure! I hope fashion and fine eating are involved! I saw the title and started thinking of my rules: nothing too tight, doesn’t fit, needs constant fiddling, itchy, uncomfortable, etc. Maybe also anything that needs mending (unless you are shoveling dirt or somesuch and plan to discard it afterward). And voilà, just what you said. Amen!